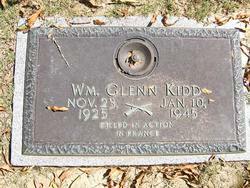 William Glenn Kidd was born on November 23 ,1925 in Whitley County, Corbin, KY to Effie (Sterl). He enlisted in the Army at Thomas Newport, KY on Dec. 27, 1943. He was a Private First Class. William was in the Army for two years until he was killed in action while serving in France. His grave is in Memorial Park Cemetery, Memphis, Shelby County, Tennessee.